Written and directed by acclaimed director and playwright Jonathan Holloway, this ambitious adaption of Robert Louis Stevenson’s much-loved thriller tells the story of Henry Utterson, a London lawyer who investigates strange occurrences between Dr. Jekyll and the alleged murderer Hyde. Merging Weimer cabaret with a stunning live audio score, Holloway’s production is described as a “visual feast” of desire, destruction and dastardly experimentation with a spectacular set design by Neil Irishof. Olivia Winteringham (artistic director of performance ensemble KILN) stars as Dr Jekyll, a female scientist who, in an attempt to escape the unspeakable horrors in her past, conducts bizarre scientific experiments on her own body. Holloway’s startling reimagining of Jekyll tears out the heart of the issues it explores – gender, power, identity, self, freedom and individuality – as the fascinating and disturbed scientist tries to turn herself into a man through self‐medication and brutal self-surgery. “This production of Jekyll & Hyde is a rebirth of Red Shift’s much-loved signature style” comments writer and director, Jonathan Holloway. 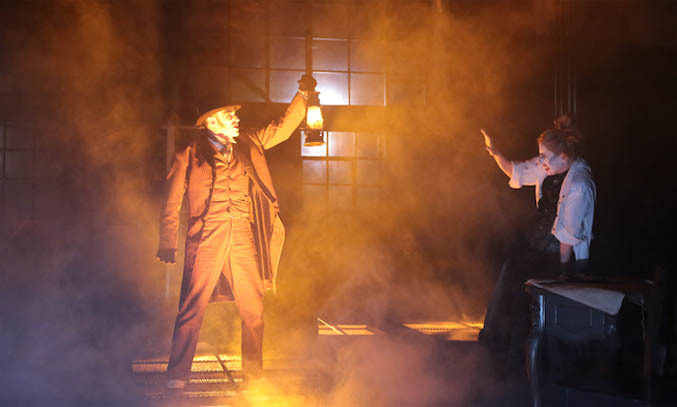 Innovative, creative and packed full of visceral energy, Holloway’s adaption of Jekyll & Hyde promises to delivers a theatrical experience unlike any other. Don’t miss it!